Manila—(PHStocks)—Philippine stocks recovered yesterday’s losses, buoyed by optimism in U.S. growth prospects as well as expectations of higher global growth forecasts by the International Monetary Fund. The benchmark Philippine Stock Exchange index (PSEi) gained 0.66% or 39.04 points to close at 5,986.48 today, 8 January. All counters are in the green, led by the Property sector, which rose by 1.43%. 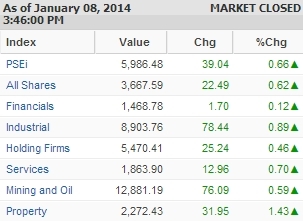 The Industrials edged higher by 0.89%, while the Services sector went up by 0.7%. The Mining and Oil sector continued its rally for the fourth session, gaining a further 0.59% today. The All-Shares index increased by 0.62%. Trading was moderate. Value turnover reached PhP5.52 billion on 615 million shares traded. Foreign buying reached PhP3.2 billion while foreign selling totalled PhP3.43 billion. There were 78 gainers against 80 decliners, while 36 stocks were flat.